Hotel Juárez, the new production of Francis Alÿs, emerges in a national landscape in which artistic and social action became further politicized by one of the most violent crises the country has experienced over the last decades. In Ciudad Juárez Alÿs puts into practice the strategies of resistance that he has previously developed in other survival contexts; that of generating “poetic politics” in situations of extreme social conflict. Ciudad Juárez has been a space of superimposed and interconnected layers of human, social, economic and political abuses. If the bodies of missing women were once appearing in the desert, today they are crudely thrown on the city streets. Meanwhile, the war between the drug cartels and the barbaric government politics transformed a city once famous for its torrid nightlife into an urban ghost town. The most recent attack on Juárez has been the destruction of its urban and architectural fabric under the misguided/erratic slogan stating, “Festivity is the protagonist and contender of organized crime and massacre.” The Mexican state obliterated the city’s historical center: its bars, brothels, theaters, canteens, small commercial spaces and hotels. It is within this context that Francis Alÿs, along with his team of collaborators Alejandro Morales, Félix Blume, Julien Devaux and Rafael Ortega, produced two new projects over the course of 2013-4, proposing tacticals of survival as an artistic practice in Mexico’s current dramatical context. Paradox of Praxis #5 is part of a series of actions registered in video in which Alÿs performs seemingly futile tasks or labors. 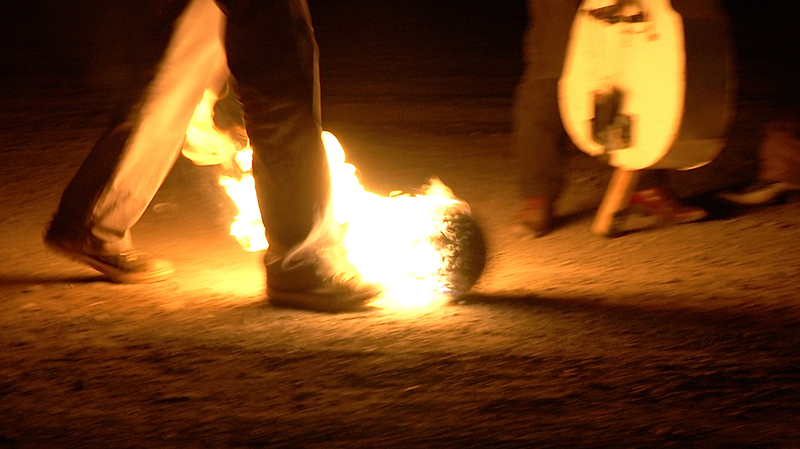 If in 1997, in Paradox of Praxis #1, the artist pushed an ice block throughout the historical center of Mexico City until it completely melted; now Alÿs kicks a ball of fire in the destroyed urban and social tissue of Ciudad Juárez. But, in this occasion, the prop does not disappear, it remains suspended in this border landscape, further politicizing the poetic gesture and drawing the imaginary map of a devastated city. The phrase Sometimes we dream as we live, and sometimes we live as we dream (the aphorism introducing Paradox #5) converts the critique of artistic practice per se to what Alÿs describes as the context dictating the action’s development and its outcome.